Thousands of people gathered across Poland over the weekend to protest against the government, stepping up a confrontation that began as a dispute over media freedom. 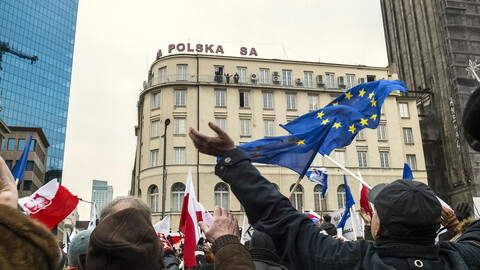 Protesters rallied in the capital Warsaw, around the parliament, the presidential palace and the seat of the constitutional court. They waved national and EU flags, chanting slogans including “Free media, free people”, “Solidarity with journalists”, “Freedom, equality, democracy”, and “Enough, we want election”. 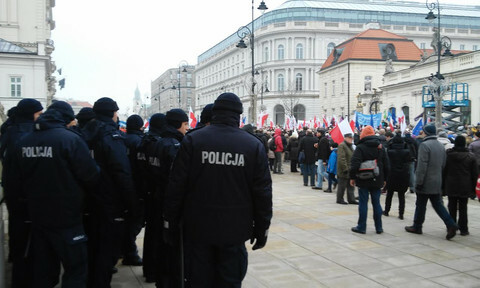 According to the Warsaw City Council, around 5,000 and 3,500 protesters demonstrated on Saturday and Sunday respectively. 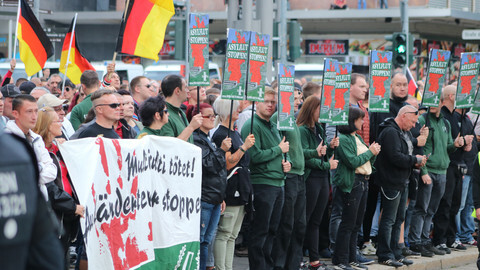 Smaller groups took to the streets in Krakow, Poznan, Gdansk, and several other cities. "I have never seen so many young people at our rallies," Radomir Szumelda, one of the leaders of the Committee for the Defence of Democracy (KOD), Poland’s leading civil movement, told EUobserver. "They perfectly understand that the most crucial value, freedom, can be taken away from them." “I have nothing to do with communists; I am neither left nor right. I just think my country is not going in the right direction,” said Marek, a 25-year-old who joined the protests. The crisis started when the ruling Law and Justice party (PiS) limited the number of journalists allowed to cover parliamentary sessions. 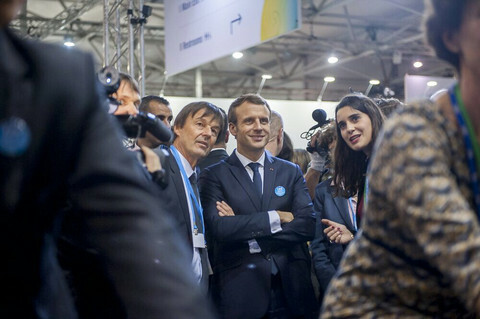 The government said the rules would help journalists to better organise their work, and are no different to those in many other EU countries. The move provoked resistance from most of the press and leaders of opposition, who on Friday blocked access to the podium in the parliament's lower house. 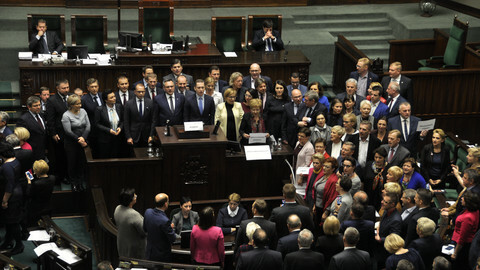 PiS then moved the session to a smaller room, where no media and only a few opposition MPs were allowed, and passed next year’s budget bill with a show of hands. The opposition said the vote was unlawful but a PiS spokeswoman insisted that "everything was in accordance with Polish law". Opposition MPs said they would continue a sit-in until Tuesday and some protesters said they would continue the protest. 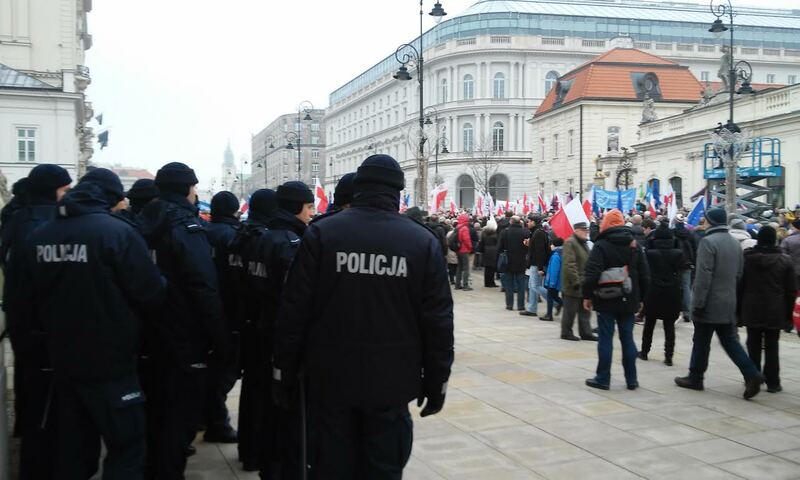 “We will stay on the streets,” said KOD's Radomir Szumelda. “We want protests to spread to smaller cities and to engage all the people dissatisfied with the government," he said, adding that KOD planned to join teachers and parents on Monday to protest against an education reform. 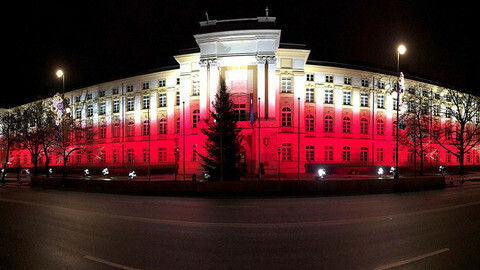 On Saturday, prime minister Beata Szydlo said the blockade of parliament by the opposition was “scandalous”. She added that people were free to protest, but had to respect the views of others. Public TV stations said that the protests were "an unsuccessful attempt to destabilise the state” and accused protesters of “protecting former communist state security". Pro-governmental outlet wPolityce even started to spread rumours that the opposition planned a violent occupation of the parliament. On Sunday, president Andrzej Duda offered to mediate between the two sides, but a meeting with leaders of all parliamentary parties brought no results. There is still time to calm things down, said Agnieszka Pomaska, an MP from Civic Platform, the main opposition party. “Everything depends on Jaroslaw Kaczynski, the actual leader of Poland," she told EUobserver, referring to the influential former prime minister and PiS leader. She said she thought Kaczynski might be preparing to step up the confrontation with the opposition, and that he did not appear to be afraid. On Saturday, the president of the European Council and former Polish prime minister Donald Tusk, who was in Poland for the weekend, urged the government to respect the constitution. Since taking power in October 2015, the PiS government has taken control of the public media, its state prosecution and civil service, and it has neutralised the constitutional court. The government passed a law last Tuesday (13 December) that would restrict rights to assembly. The bill is now waiting for the president’s signature. A PiS-controlled parliament and a loyal president mean Kaczynski can wield power with more freedom than almost any political leader in Poland’s modern times. The 67-year-old politician however said in October that he was considering stepping down. At pro-government rally on Sunday evening, people chanted Kaczynski's first name in an effort to dispel any doubt. 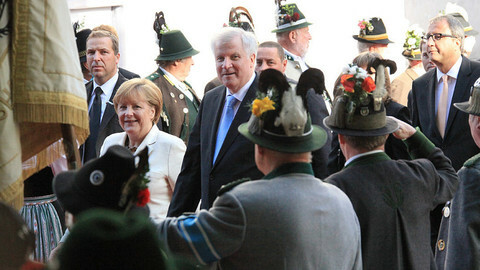 “Our side has only one leader, and this is Kaczynski,” said Joachim Brudzinski, the deputy head of parliament. 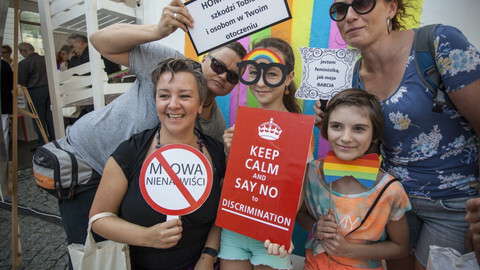 The three parliamentary opposition parties, centre-right Civil Platform and the Polish People’s Party, and liberal Nowoczesna, took a unified stance against PiS. “We have this feeling that for today the opposition stays united. We don’t see each other as enemies, we don’t compete, as we all think that the enemy – not ours, but Poland’s – is Jaroslaw Kaczynski,” said Civil Platform's Agnieszka Pomaska. But the opposition is far from being united, noted KOD's Szumelda. It "must know what kind of Poland it wants after PiS loses power someday", he said. "Now, there is no such a positive vision. Being anti-Kaczynski is simply not enough." According to sources close to PiS, Kaczynski is expected to defend the legality of the budgetary session, but to withdraw from restrictions for journalists. “It would be reasonable,” said Szumelda. “He has heard the voice of the people. If he continues to oppose it, anti-PiS sentiment will grow in society." Dismayed by the lack of progress in solving Poland's rule of law crisis, some MEPs are demanding that the EU begins formal breach proceedings that could end up with Poland being stripped of voting rights. Ruling Law and Justice has promised to overhaul the NGO sector. The move could strain relations with Norway, a major donor to Polish civic life. Poland has accused the European Commission of lacking objectivity and understanding of the intricacies of the Polish legal system. 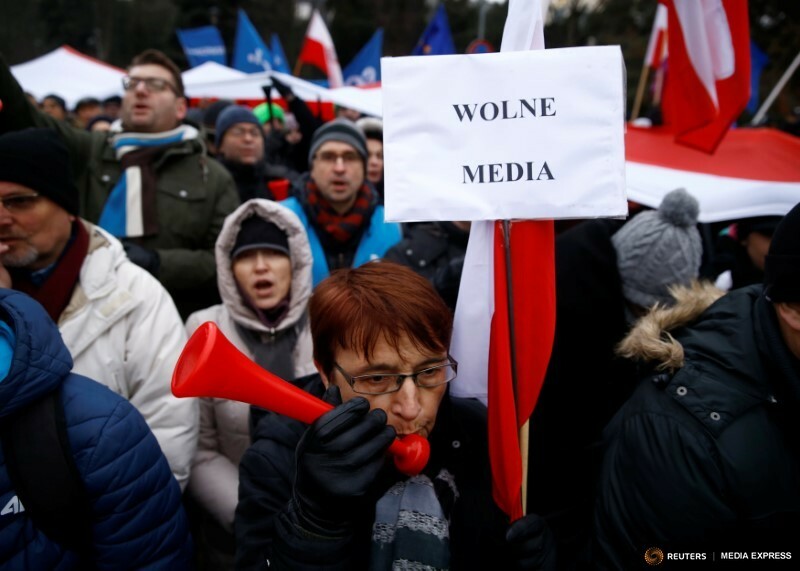 The coming days will be crucial, liberal opposition leader Ryszard Petru told EUobserver, after a weekend of street protests and escalating confrontation over media freedom and the budget.